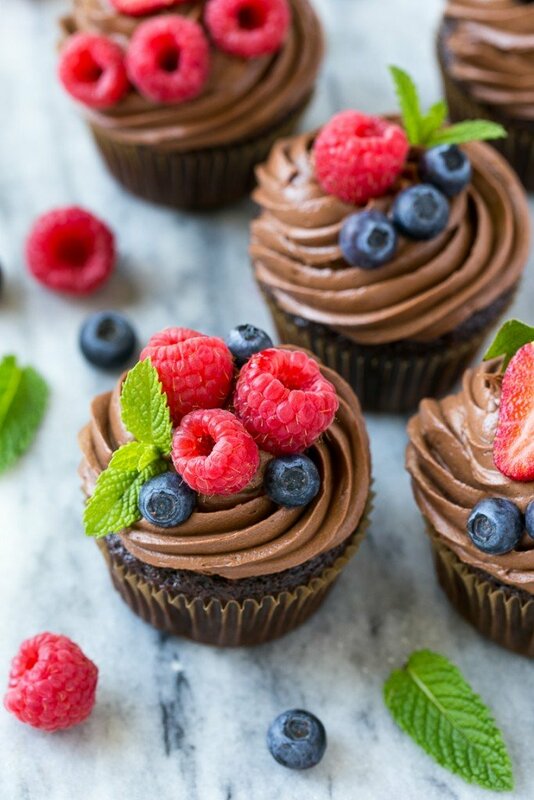 This recipe for chocolate hazelnut cupcakes is chocolate cupcakes filled with milk chocolate hazelnut spread, then finished off with chocolate hazelnut frosting and fresh berries. The perfect treat for a special occasion! This post is sponsored by Peanut Butter & Co. – thank you for supporting the brands that make Dinner at the Zoo possible! 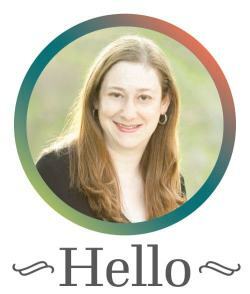 It is celebration season in my family – between April and July we have a ton of birthdays, anniversaries and other special occasions! My husband recently had a birthday and he is a chocolate lover, so I knew some kind of chocolate cake was in order. I decided to make these chocolate hazelnut cupcakes to celebrate his special day. 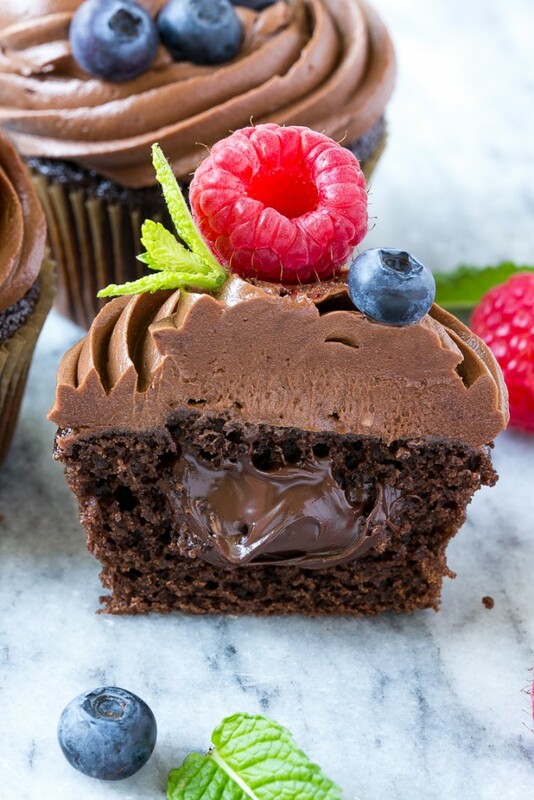 These are no ordinary cupcakes – they’re stuffed with Chocmeister® milk chocolately hazelnut spread and are also topped off with a chocolate hazelnut frosting. These cupcakes are a decadent treat that are actually quite simple to make. This recipe starts with a basic chocolate cupcake. The next step is to cut a hole in the middle of the cupcakes – I have a little cupcake coring tool that I bought for less than $5 at a kitchen store, but you could also use the back of a piping tip or a small cookie cutter to cut the holes. The cupcakes are filled with Chocmeister® milk chocolately hazelnut spread which makes for a fun surprise when you bite into them. 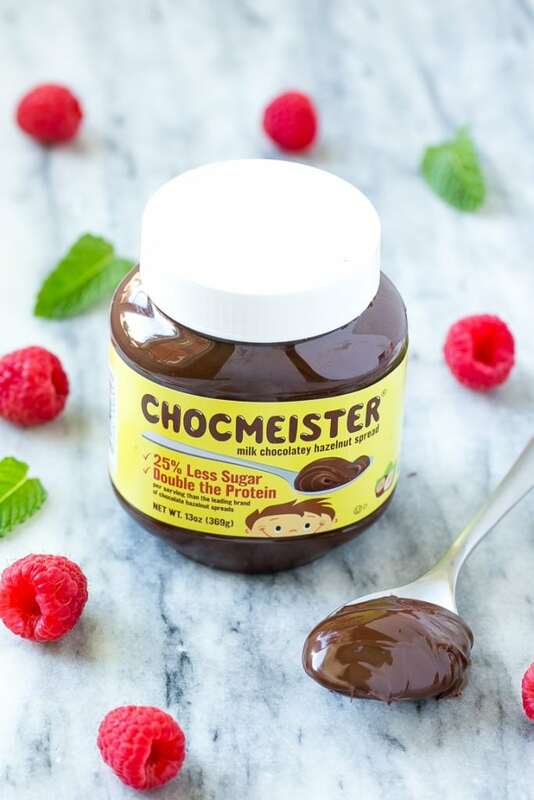 Have you tried Chocmeister® milk chocolatey spread yet? It’s a chocolate hazelnut spread with 25% less sugar and double the protein of other chocolate hazelnut spreads. It’s perfect in desserts like these cupcakes but also wholesome enough that I feel good about feeding it to my kids. We use Chocmeister® milk chocolately hazelnut spread as a dip for fruit, spread on toast or topping for pancakes. After the cupcakes are stuffed with Chocmeister®, it’s time to make the frosting. 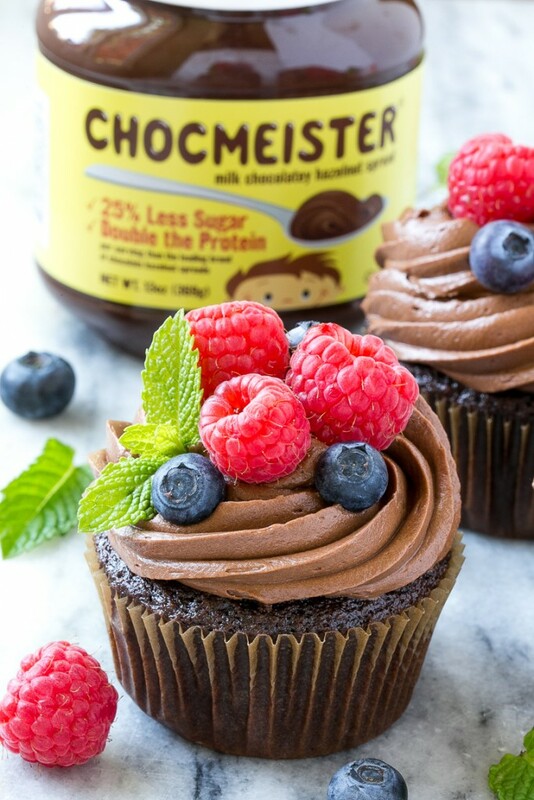 The frosting is a simple buttercream that’s flavored with a healthy dose of Chocmeister® milky chocolately hazelnut spread which makes a great complement to the cupcake base. 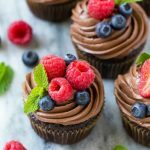 The finish touch is an assortment of fresh berries – the kids helped me decorate these chocolate hazelnut cupcakes and were so excited to show them to their dad! 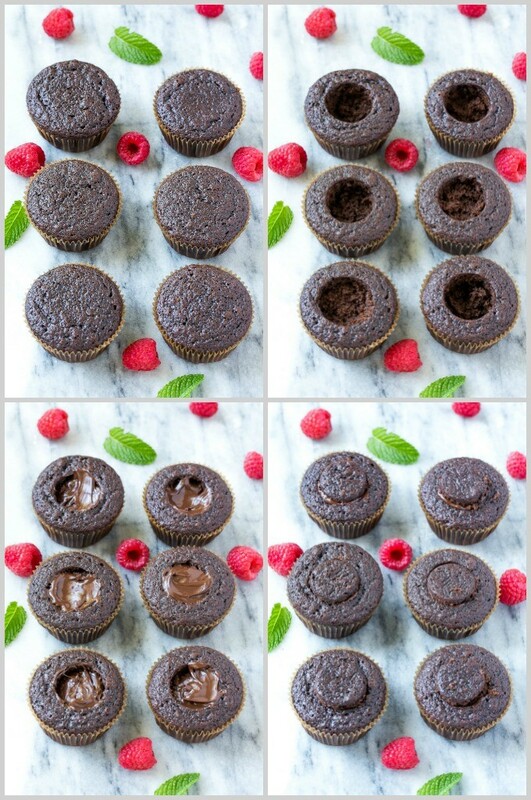 Cut a hole into the top of each cupcake with a cupcake corer, small cookie cutter or the back of a piping tip. Reserve the cupcake cores. Spoon 2 teaspoons of Chocmeister® milk chocolately hazelnut spread into each hole. Place the cupcake cores back into the holes - you may need to trim a bit off the bottom so that they fit. Beat butter at medium speed with a stand mixer or hand mixer for 2-3 minutes until smooth and creamy. Add the powdered sugar and continue to beat on medium speed until combined. Add the Chocmeister® milk chocolately hazelnut spread and beat for 30 more seconds. Add the milk and vanilla and beat until combined. If you need to thin the frosting you can add more milk, 1 teaspoon at a time, until desired consistency is reached. I have made these multiple times and everyone loves them! I would love to make chocolate banana bread. I would probably make a chocolate cinnamon roll. As tempting as these look, I’m not huge on making cupcakes. I think I’d do fancypants grilled cheese with this and brie. Nom nom nom!! These look yummy, can’t wait to make them. I’d cover it in milk chocolate and make round bite size balls. I would use it like peanut butter and make cookies, muffins and spread it on toast or in a sandwich. I am not very creative in the kitchen, so I would probably just use it as a spread. These are drop dead gorgeous Sara and look like a chocolate lover’s dream come true. I know your husband was thrilled with them! These are gorgeous! I just want to sink my teeth into one. Pinning! The first thing would be to just take a spoonful all by itself! They I’d spread it on bread with a sliced banana. 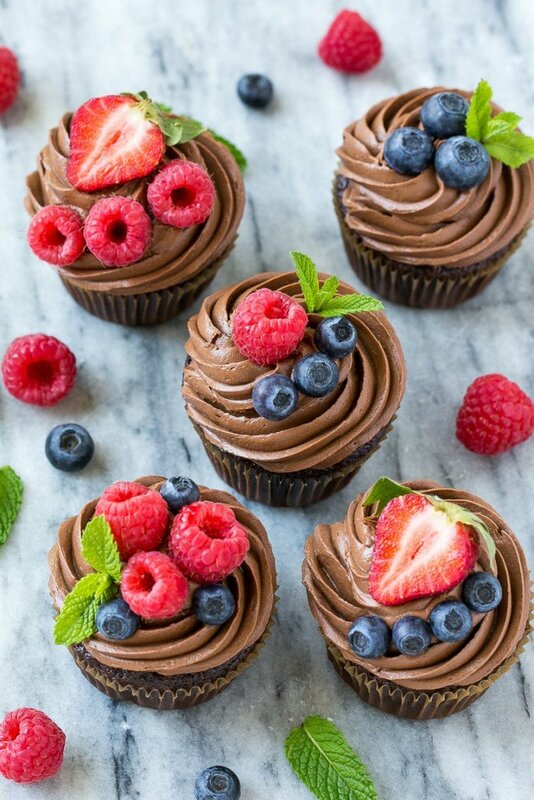 These cupcakes look so amazing and I love hazelnut spread! Wow, I fell in love with the outside but when I saw the inside, Ialmost fell over. These are such beautiful cupcakes, Sara! I am truly blown away. Absolutely beautiful and I love the chocolate hazelnut filling, because you can never have too much chocolate! These look so creamy – and I love a good hazelnut spread. Perfect for the chocolate lover in my family … me!